Competition is fantastic fun. When it occurs in sports and board games and card games, it creates that excitement and challenge and fascination and focus. You get a clear winner and a loser but that's part of the fun and aim of it. It isn't something personal. But competition as a way of responding to interpersonal conflict is not fun and is highly ineffective. It can seem as though it works. Which is sadly why it is the way most commonly used as a response when a conflict has not been resolved immediately and unconsciously - which is what we do most of the time. We can suppress a conflict and feel as if we've 'won'. But 'winning' in a personal conflict is basically an oxymoron as no-one wins when a conflict is responded to in that way. Even the 'winner' doesn't win. When conflict is responded to as a competition we are back to the lid on the boiling pot. At first it looks like we've 'won' as we can't see the contents of the pot bubbling away, but if we take our eye off it, it will soon bubble over again. And all the time we have to watch it we can't get on with our lives and enjoy them. The fastest gun was always having to look out for the next challenger. Always on guard, wary, worried, frightened. The competition approach to personal conflict breeds the Rescuer Syndrome. We feel there has to be a winner and a loser and so we take sides 'for' or 'against' those involved. And through this we escalate the severity of the dispute and make it harder to resolve, as others join in on the other side to 'even up the score'. We used to think we had to destroy other predators, even to the point of extinction. We now know that there can be better ways, though too late in some cases to save the animals we destroyed. There is presently an acknowledgement that the invasion of Iraq will inevitably lead to an increase in the recruitment of those wanting to commit acts of terrorism in the future. The war on terror is based on the use of might to dominate, destroy and suppress the 'subversive' terrorists. Putting a lid on the pot. But the contents are still bubbling away and even if the parents are killed the children may carry the resentment and hatred and desire for revenge. And what was one of the major factors in bringing about the invasion of Iraq? The terrible events of 9/11. The resentment, hatred and desire for revenge that followed from this - and so the cycle continues. No-one has the moral high ground, although both sides compete to be seen as the greatest victims, in order to justify the greater revenge. We are all capable of responding this way, however destructive. But what can make it so much worse is the accumulation of allies on both sides to escalate the problem. However, we can also see that the 'terrorists' Nelson Mandela, Gerry Adams, and while not thought of as a terrorist, Mahatma Gandhi, are now, or were, leaders of their respective countries. This came about when a move occurred between the sides involved from a competitive response to their conflict to a co-operative and more creative one. These examples can lead to a belief that the approach to conflict which creates learning, connection and insight has to be preceded by a violent, competitive approach. But that clearly isn't so. We manage to adopt the co-operative approach on a regular basis with each other so often we usually fail to even notice it. Another example of competition is in the way that we can often approach parenting or teaching. In the past, thankfully, the use of corporal punishment was used to 'win' disagreements between child and adult. This resulted in a belief that to 'win' in an argument, force was the ultimate convincer, even where the adult was clearly on 'shaky ground'......in fact, particularly in those situations. - Isaac Asimov in Foundation. 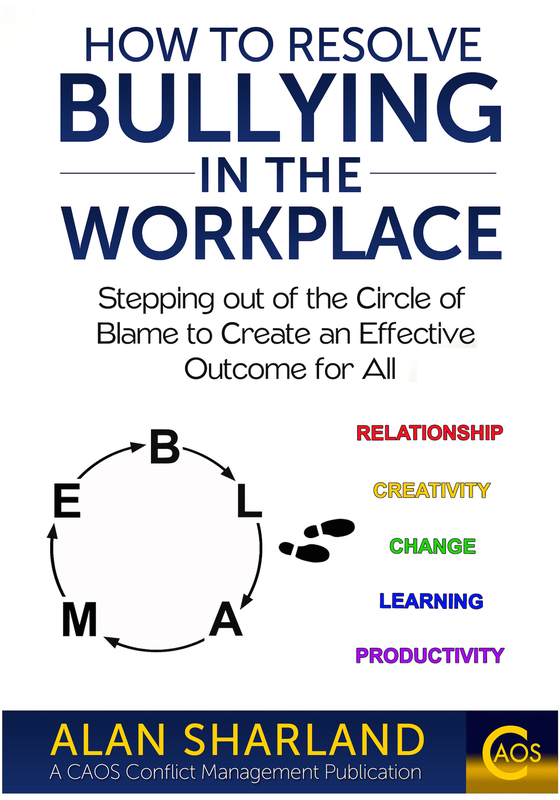 The competition response to conflict perpetuates the phenomenon that 'the bullied becomes the bully' and there are plenty of current debates between those who advocate a no-blame approach to bullying and those who seek to simply 'punish' the bully and 'enforce' a change of behaviour....... the latter being no different to bullying itself. You can't 'enforce' a change of anyone's behaviour, only suppress it. If someone is going to change their behaviour, there has to be ownership by them of that decision. Otherwise it will be superficial and temporary. And they will have to be 'watched' and 'monitored' and we will have to be 'on our guard'. Just like with a lid on a boiling pot. Similarly, for capital punishment. If you kill someone, the state will kill you. When you do it, it is a crime. When the state does it, it is 'enforcement' of the law. I've never quite understood the hypocrisy in that. Unless I see it as another form of competitive response to conflict. And then I see it as manifesting all over the world. The terrorists killed us, so we will kill the terrorists. Only more of them. So we 'win'. But as I will always emphasise, this is not about saying Those over there who do that are no good, and ineffective at responding to conflict while We are 'superior' in our approach. That would not be in keeping with the Principle that we Challenge the behaviour and not the person - which would be to continue the ineffective communication and ineffective approach to conflict resolution. We all fail to do this. In our own way. At our own scale. We just aren't always able to adopt a more effective way. There must be a more effective way, because, as an approach to interpersonal conflict, trying to 'win' it doesn't work. Learning to observe and understand our responses and identify whether they are effective or not is what this website is designed to support. Think about anyone you get along with. And compare with someone you don't get along with. How often do you monitor what they are doing, check up on them, have serious arguments with them, try to stop them doing things? Compare your answers for both people. With one there's just no competition. With the other there's a constant 'game'.......though it's not as much fun as we normally associate with a game. It's more like a wearing, stressful, debilitating battle. Belief systems create boundaries. ............ In a rigid belief system, anything that jeopardizes those boundaries must be defended against. One way to fulfill this constant need for defense is to attack other belief systems before they attack you. Belief systems are often a catalyst for violence. How many wars can we count that have been fought over religious beliefs and the stronger the fervor of the beliefs, the greater the violence. Much of the violence we experience daily, however, is going on internally. We are at war within, constantly defending our old beliefs from new and opposing beliefs and thoughts (even if these new thoughts are of our own making). We begin to witness where the root of all violence lives - within ourselves and our need to protect our belief systems. 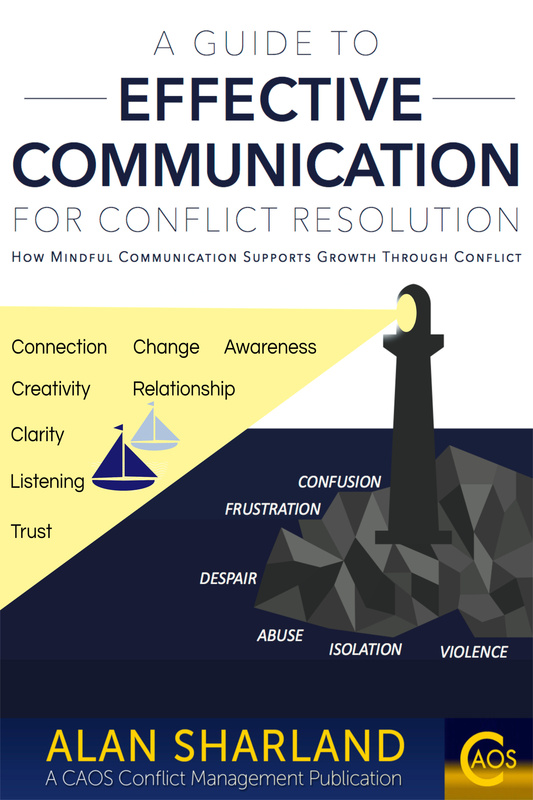 As stated elsewhere on this site - Effective conflict resolution is more about self-awareness than about techniques for changing others - whether we are involved in a conflict ourselves or we are wanting to assist others with theirs. Sometimes however, the whole notion of having to get into a competition about a conflict feels as if it is too much to think about, as we've seen the kinds of consequences it leads to. This is where we see conflict as a problem that has to be avoided........ It doesn't tend to work in stopping us from thinking about it however.